Amy Fedele and myself were lucky to be on KXIP CBS Channel 5 San Francisco to promote the 2018 HDSA San Francisco Team Hope Walk (October 13, 2018). Thank you CBS, and Pat Rose, San Francisco publicist who donated her time to get us on TV! The Team Hope Walk program is Huntington’s Disease Society of America’s (HDSA) signature grassroots fundraising campaign designed to provide hope and support for those touched by this devastating disease. All proceeds support HDSA’s mission to improve the lives of people affected by HD and their families. In 2018, 94 Team Hope Walks will be held across the U.S. Yesterday, Sunday November 5th, 24 HDSA NYC Marathon Team Members ran the historic event. The athletes raised approximately $164,496.00 for Huntington’s Disease Association of America (HDSA). Congratulations to all the runners and thank you! Together we can win the fight against Huntington’s disease. Therese’s memoir/nonfiction, Watching Their Dance: Three Sisters, a Genetic Disease and Marrying into a Family At Risk for Huntington’s, is available on her author website http://www.theresecrutchermarin.com & on Amazon, B&N, & in Kindle, Kobo, Nook, iBooks file. 100% of the profits from Therese’s book is being donated to HDSA. Just a few weeks ago,The California Institute for Regenerative Medicine was awarded a nearly $8 million grant to University of California, Davis, stem cell researchers to launch a special clinical trials program in Sacramento to accelerate the therapeutic development and delivery of stem cell therapies in human patients. Therese will be at the event promoting her memoir/nonfiction book, Watching Their Dance: Three Sisters, a Genetic Disease and Marrying into a Family At Risk for Huntington’s. The book is available on her author website: http://www.theresecrutchermarin.com & on Amazon, B&N, & in Kindle, Kobo,Nook, iBooks format. 100% of the proceeds from the book is being donated to Huntington’s Disease Society of America (HDSA). Huntington’s disease (HD) is a fatal genetic disorder that causes the progressive breakdown of nerve cells in the brain. 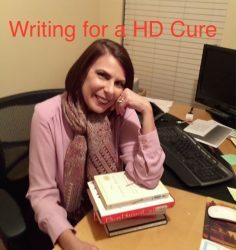 Therese’s first book is a memoir/nonfiction, Watching Their Dance: Three Sisters, a Genetic Disease and Marrying into a Family At Risk for Huntington’s, is available on her author website http://www.theresecrutchermarin.com & on Amazon, B&N, & in Kindle, Kobo, Nook, iBooks file. All fundraising events for Huntington’s disease (HD), large, small, in the U.K., Ireland, Scotland, Canada are important as it moves us closer to a cure or therapy. On June 14th, 2017 John and I arrived at our first stop, Lenexa Kansas to attend our first HDSA Team HOPE Walk on June 17th. I was thrilled to visit Kansas, the state I grew up in and where I still had many relatives living. Aunt Trina and my cousins participated in the walk with us and we had a blast together. All dollars from HDSA Chapter fundraisers are sent to HDSA Corporate in NY to fulfill the HDSA Mission: “Improve the lives of everyone affected by Huntington’s” disease”. I sold 11 books at this walk, $7.00 per book is donated, which equates to $77.00, so I rounded up and donated $100.00 to the event. Therese’s memoir/nonfiction book, Watching Their Dance: Three Sisters, a Genetic Disease and Marrying into a Family At Risk for Huntington’s, is available on her author website http://www.theresecrutchermarin.com & on Amazon, B&N, & in Kindle, Kobo, Nook, & iBooks format.